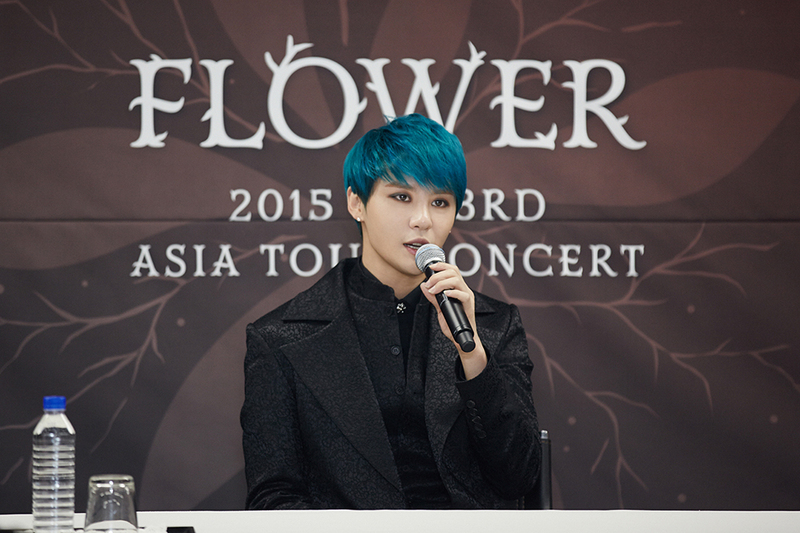 2015 XIA 3rd ASIA TOUR CONCERT ‘FLOWER’ was the third international concert tour of JYJ’s member Kim Junsu (XIA), in support of his third full-length album, Flower. 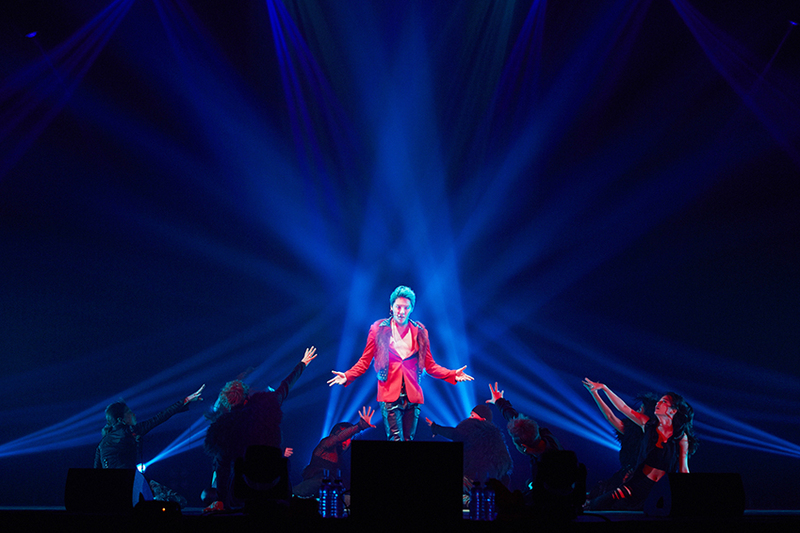 XIA toured four countries seven cities and held two additional encore shows in Seoul over a period of two months. XIA performing “나비(Reborn)” in Fukuoka. Photo: C-JeS Entertainment. The dates for the shows in Japan were first announced by C-JeS Entertainment on January 19, 2015 through JYJ Japan Official Website while the shows in Seoul were revealed by Interpark on January 28, 2015. XIA performed songs from his Tarantallegra, Incredible and Flower albums. The show lasted for about two and a half hours while the Seoul encore concerts ran for about three hours. Stage rehearsals began on February 28, 2015 in Osaka-jō Hall. The first round of ticket sales for the Seoul concert was opened to public on February 3, 2015 as announced by Interpark, the ticketing agency for the show in Seoul. The second round started two days later. LOOK Korea was the only exclusive authorized dealer and travel agent for international and Japanese fans. The date for the Shanghai concert was added to the tour on February 15, 2015. Thai concert organizer, Do Concert, announced on March 2, 2015 that the tour will also visit Bangkok. Two encore concerts in Seoul announced on March 24, 2015 were scheduled to take place in April 2015 as a gratitude for the support given by fans towards his new album. In an interview clip with SBS PopAsia released on March 23, 2015, XIA expressed his interest in holding a show in Australia but due to the short run of the Asian tour, he said there are no plans for a concert yet. XIA performing “Reach” in Shanghai. Photo: C-JeS Entertainment. About 15 songs were performed in each show. A special original TV soundtrack medley was included in the set list, in which he sang a mix of five tracks from the TV drama series Scent Of A Woman, The Fugitive of Joseon, Empress Ki, Mr. Baek and The Innocent Man. “Loving You Keeps Me Alive”, a track from The Musical Dracula, was included in the tour. XIA held a ‘Genie Time’ corner, where he granted three wishes of his fans on stage, throughout the tour. The Asian tour this time around had a lot of effort and detail that were put into the stage design. 50 lights in different corners would change every time, putting on a mysterious effect for the shows. The sides of main stage also had designs to match a flowery theme. 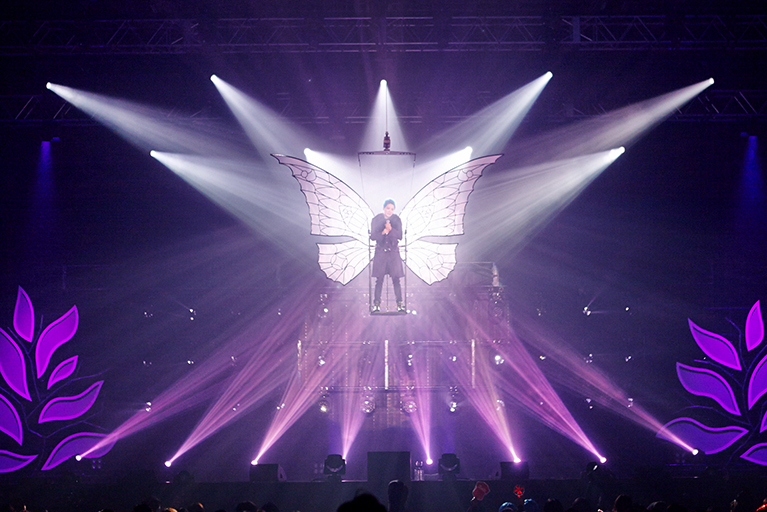 During “My Night”, XIA sat on a chair in the stage center with blue lights shining down upon him. Images of trees and a moon in a short motion clip were projected behind him to give out a magical yet mysterious feel. Epik High’s Tablo, being a special guest, performed the rap for “꽃(Flower)” for the second show in Seoul. 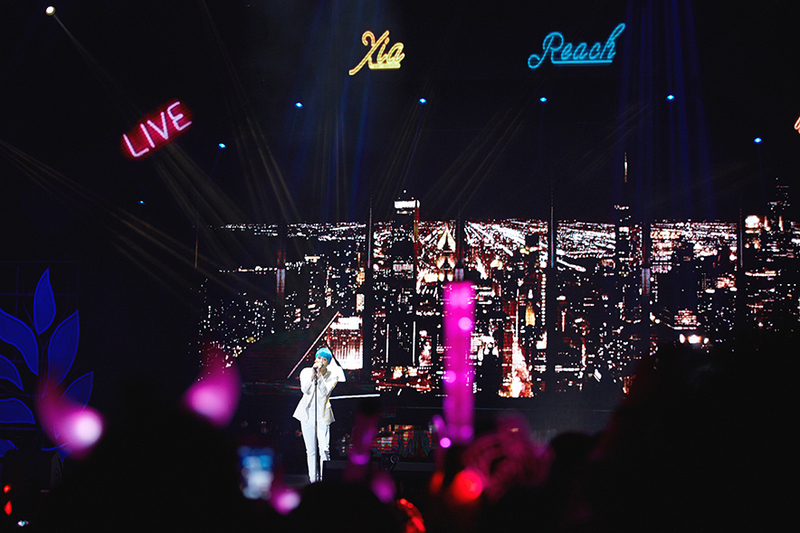 Tablo was the first surprise guest to have performed at XIA’s solo concert, apart from the ballad and musical concert with orchestra series. On that same night, “Tarantallegra” was added after “F.L.P” as a double encore request from fans during the show’s ‘Genie Time’ corner. XIA performed an acoustic cover rendition of Tohoshinki’s “Love in the Ice” in Fukuoka and Nagoya, as a dedication to his JYJ fellow member, Kim Jaejoong, who was enlisted in the army on March 31, 2015. XIA and Yang Dong Geun performing “Out Of Control” in Seoul encore. Photo: C-JeS Entertainment. Two new tracks from the Flower album were performed in the encore shows including “그 말 참 밉다(That Is So Mean)” and “Hello Hello”, replacing the original TV soundtrack medley and “사랑숨(Breathing In Love)” respectively. 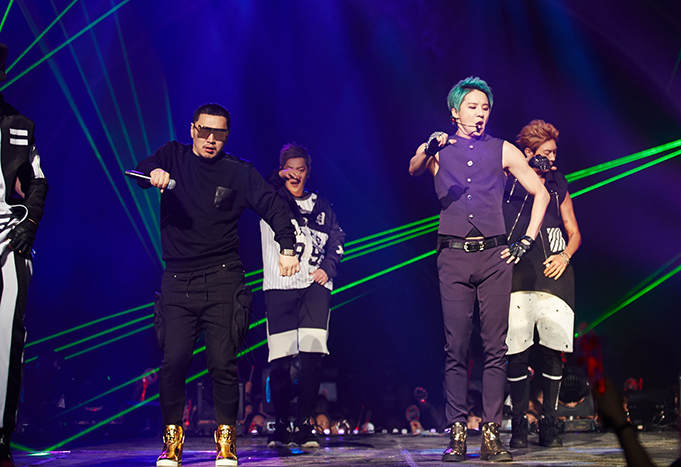 XIA also added a dance medley where he performed a mix of songs “Mission, “Tarantallegra”, “Turn It Up” and “Fever”. Yang Dong Geun was the featured guest to perform the rap for “Out Of Control” for the second encore show in Seoul. XIA premiered new costumes for certain performances in these two encore nights. In Bangkok, 200 fans from selected ticket zones were randomly chosen to attend a press conference, which was held in Lebua at State Tower. XIA’s press conference in Seoul. Photo: C-JeS Entertainment. A special concert website was set up for the tour in Japan on January 19, 2015. 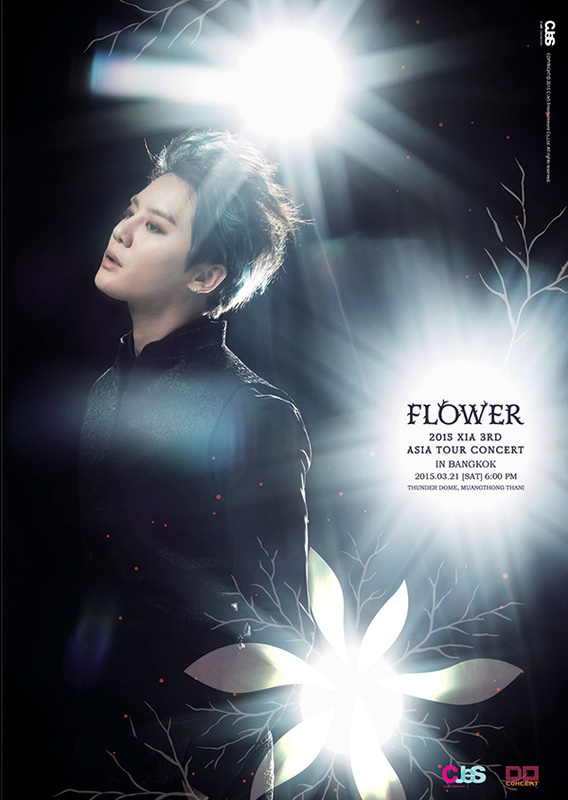 The first promotional poster for the Asian tour was unveiled on February 12, 2015, which shows XIA in a black shirt and a vest. C-JeS Entertainment said the poster was created with the use of flash in the dark and an image of a flower. XIA bus wraps operated from February 23, 2015 till March 8, 2015 around Seoul to promote the two-night Seoul concert. A 15-second teaser was released on February 17, 2015 that showed snippets from “Tarantallegra”, “Incredible” and “Uncommitted” music videos. The tour’s name and concert dates for the shows in Japan were mentioned towards the end of the clip. 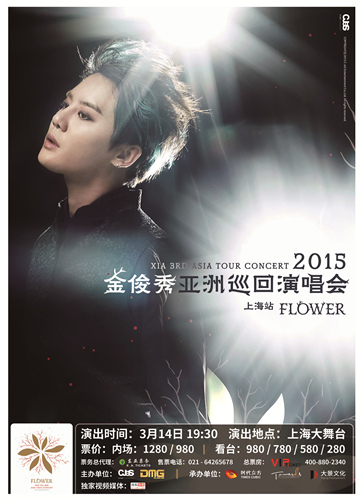 An exclusive video message by XIA for the Shanghai concert was released on February 28, 2015. A second video message for the Bangkok concert was released on March 4, 2015. A press conference was held for the tour on March 7, 2015 at 4:30PM local time in Seoul’s Jamsil Indoor Stadium. The singer revealed that “Flower” was originally to be titled as “Take My Hand”. He said that the lyrics of the song was like that of a flower, so the change was made on the day before the recording took place. XIA performing “꽃 (Flower)” in Osaka. Photo: C-JeS Entertainment. 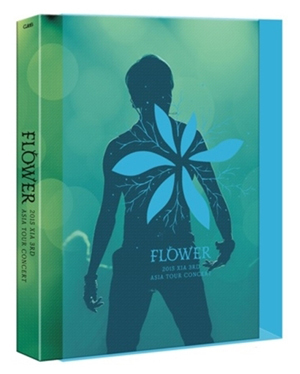 XIA’s “꽃(Flower)” performance from the second concert in Seoul was released on March 21, 2015 as a gift for fans after his Flower album topped major music charts during the first week of release despite facing difficulties with broadcast promotions. The Seoul encore concert was filmed and released as a 3-disc live concert DVD on August 26, 2016. The third disc includes a 28-minute behind the scenes and interviews as XIA tours in China, Thailand and Korea. The DVD set comes with a 100-page photo book and six pieces of mini posters. The Japanese edition was released on the same day. A new similar live 3-DVD will be released on April 14, 2017 which was recorded from the shows in Tokyo. 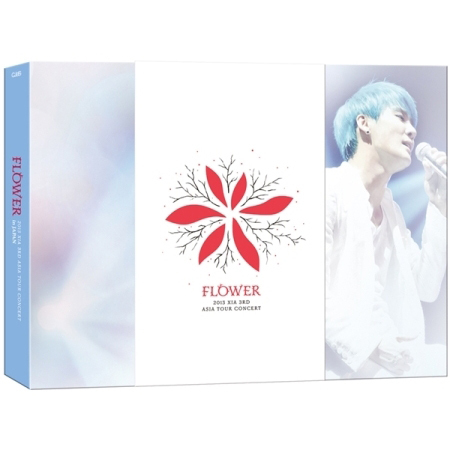 The first two discs includes the Japanese performances in Yoyogi National Gymnasium (1st Gymnasium) while the third disc showcases the recording scene of his Flower album, dance practice clips for the tour, press conference event held in Tokyo, and other concert highlights took place in Osaka, Tokyo, Fukuoka, and Nagoya. The DVD set will also come with a 100-page photo book and six pieces of mini posters. 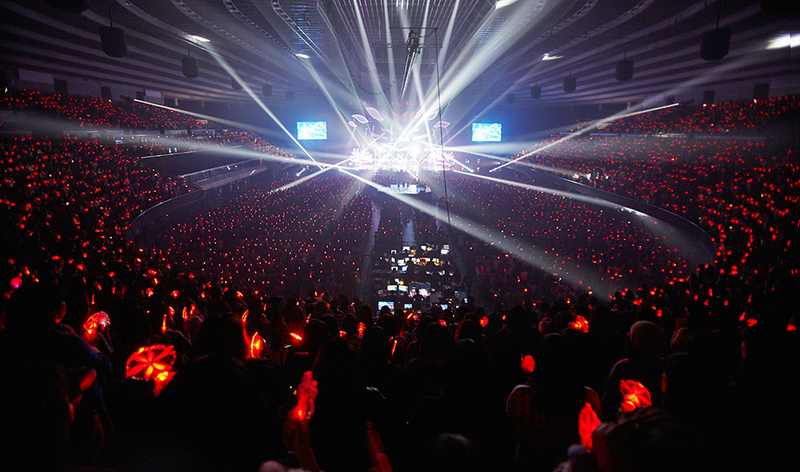 The crowd in XIA’s Osaka show. Photo: C-JeS Entertainment. Epik High and Tablo’s family members attended the second Seoul concert on March 8, 2015. BEAST’s Lee Gi Kwang and musical actor Kang Hong Suk came to watch the first Seoul encore concert on April 18, 2015. Tickets for the March 2015 Seoul concerts were sold out in less than 20 minutes after they went on sale and C-JeS Entertainment received requests for additional shows from fans. The Seoul encore shows in the tour achieved a rare breakthrough to sell out tickets in just three minutes. On March 13, 2015, more than 20 media companies attended that day’s press conference in Shanghai Marriott Hotel, including Chinese online media Sina and Sohu Video, TV media Xin Yu Le Zai Xian (新娱乐在线), and several famous video platforms such as Youku, Tudou and iQiYI. “Tarantallegra” was added after “F.L.P” for the second Seoul concert. “Love in the Ice” was added after “Musical In Life” in Fukuoka and Nagoya. “Loving You Keeps Me Alive” was performed before “F.L.P” in Fukuoka and Nagoya. Osaka concert goods. Photo: C-JeS Entertainment. Seoul encore concert goods. Photo: C-JeS Entertainment. 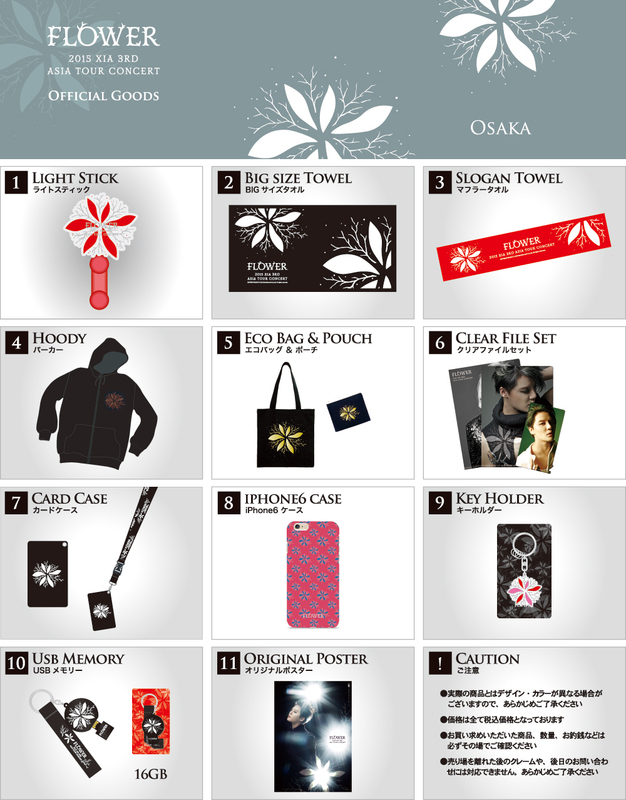 The list of goods was revealed three days ahead of the Osaka concert through JYJ Japan Official Website. The sales of the merchandise for the Osaka shows began at 12:00PM local time from March 3 to 5, 2014. The goods for the Osaka tour were not fully available for shows in the overseas and some merchandise were removed or added depending on the demand of each country visited. Eight brand new design merchandise and three new additional items were introduced for the Tokyo concert. The new designs feature a new logo for the Flower tour including two new light sticks, big size towel, pink slogan towel, white T-shirt, redesigned pouch and canvas bag, two types of key holders, and clear file set of previously unreleased photos. The new additional merchandise include a photo picket, a mug cup and an apron. The sales of the merchandise for the Tokyo shows began at 12:00PM local time for three days. In Nagoya, four new design merchandise were sold including a black slogan towel, a new type of key holder, black edition of canvas tote bag and T-shirt. A sticker set was included in the official goods list that were not previously available in cities before Nagoya. This list is representative of the sales in Osaka. This table is representative of the sales in Seoul, Bangkok, Tokyo, Fukuoka, Nagoya and Seoul Encore. This page was last modified on March 15, 2017.